JBL mounts the 10" speaker in the bottom of its LSR310S for direct downward firing which, thanks to gravity, affords it a greater than ¾" excursion for a rich thump and creamy lows. There is an ethos today that says subwoofers shouldn't be used in a studio monitoring environment. And it stands to reason that audio/music written for mass consumption should be mixed to the reasonable lowest common denominator, which is usually bookshelf speakers. But for certain styles of music—radio rock, hip-hop, and electronic music—being able to monitor at the subaural level is crucial to the art form. 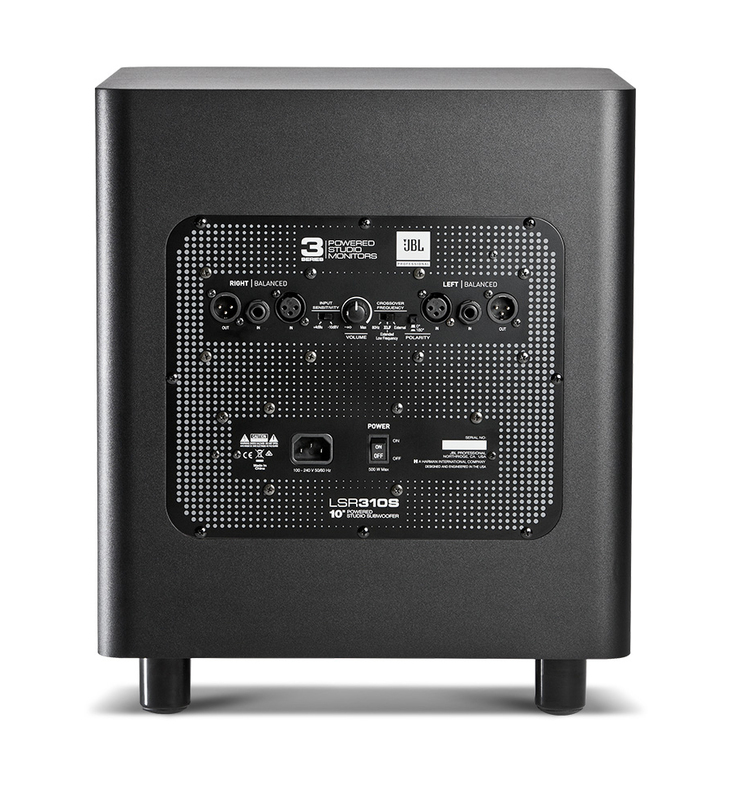 The JBL LSR310S reproduces bass cleanly down to 27 Hz (rounding off altogether around 20 Hz) to make sure the audience hears every kick drum, chord stab, and wub-wub as you intended. XLF mode, one of the LSR310S's two internal crossover modes, boosts bass frequencies at 60 and 120 Hz to emulate the sound of a loud live environment. This can help you dial in that 808 kick just right where you know your mix is going to see club, radio, and live-venue exposure. Dimensions (H x W x D) 17.65" x 15" x 15.65"